Shashi Tharoor was the official candidate of India for the succession to United Nations Secretary – General Kofi Annan in 2006 and came second out of seven official candidates in the race. Tharoor served as the UN Under – Secretary General for Communications and Public Information Between June 2002 and February 2007. He is an Author journalist and fellow of the USC Center on Public Diplomacy who was asked to address a Global Gathering of IIT Alumni shortly before Christmas in 2006 at IIT – Mumbai. Shashi Tharoor began reading books—Enid Blyton’s Noddy series – when he was three. By the time he was ten, he had published his first work of fiction, Operation Bellows, a credulity-stretching saga of an Anglo-Indian fighter pilot. In between were years when he read a book a day. And in the years since, he has published nine books and written for many Indian and foreign publications. ‘Bookless in Baghdad’ brings together pieces written over the past decade by this compulsive reader and prolific writer on the subject closest to his heart reading. Born in London in 1956, Shashi Tharoor was educated in Bombay, Calcutta, Delhi (BA in History, St. Stephen’s College), and the United States (he got his PhD at the age of 22 from the Fletcher School of Law & Diplomacy at Tufts University). His father was a newspaper executive and mother a housewife. His family has roots in Palakkad, Kerala, India. Since 1978, he has worked for the United Nations, serving with the UN High Commissioner for Refugees, whose Singapore office he headed during the “boat people” crisis. Since October 1989, he has been a senior official at UN HQ in New York, where, until late 1996, he was responsible for peacekeeping operations in the former Yugoslavia. From January 1997 to July 1998, he was executive assistant to UN Secretary General Kofi Annan. In July 1998, he was appointed director of communications and special projects in the office of the Secretary-General. In January 2001, he was appointed by the Secretary-General as interim head of the Dept. of Public Information. On 1 June 2002, he was confirmed as the Under-Secretary-General for Communications and Public Information of the United Nations. 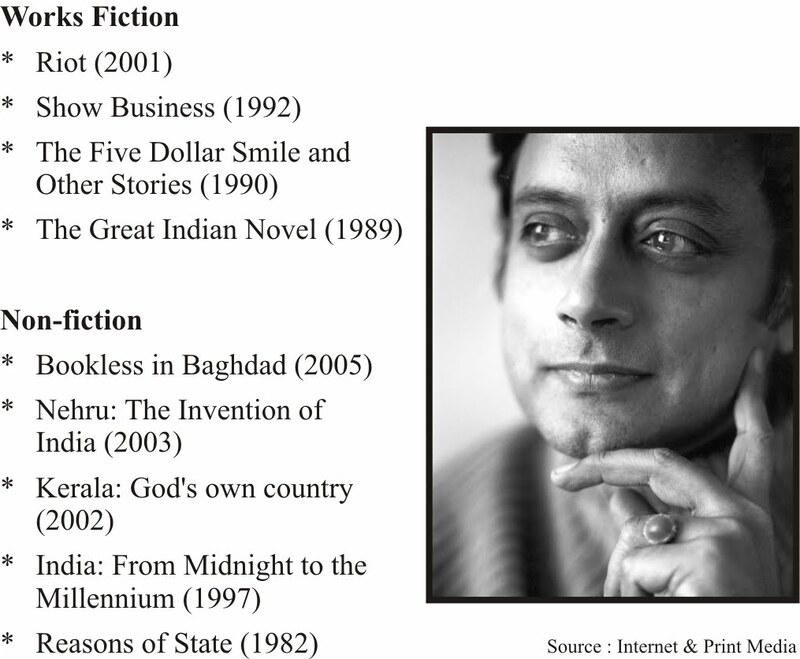 Tharoor’s prolific writing style is reflected in numerous articles, short stories and commentaries in Indian and Western publications. His books include Reasons of State (1982), a scholarly study of Indian foreign policy; The Great Indian Novel (1989), a political satire; The Five-Dollar Smile & Other Stories (1990); a second novel, Show Business (1992), which received a front-page accolade from The New York Times Book Review and was made into a motion picture titled Bollywood; India: From Midnight to the Millennium (1997), published on the 50th anniversary of India’s independence and cited by President Clinton in his address to the Indian Parliament; Riot (2001), a novel about Hindu-Muslim violence in India; Nehru: the Invention of India (2003), a biography of India’s first Prime Minister; and most recently, Bookless in Baghdad (2005), a collection of essays on writing and writers. He also co-authored, with the eminent painter M. F. Husain, a “coffee-table” book, Kerala: God’s Own Country (2004). in the early 1970s he founded the Quiz Club, which is still in existence, and revived the Wodehouse Society, which is not. Upon election as President of the College Union (campaign slogan: “Shashi Tharoor jeetega zaroor”) he relinquished the editorship of the campus humour magazine “Kooler Talk”. He was invited by St Stephen’s College to deliver the college’s 125th Anniversary Jubilee Lecture in 2005. He is an elected Fellow of the New York Institute for the Humanities and a member of the Advisory Board of the Indo-American Arts Council. At the Fletcher School of Law and Diplomacy in 1976, he founded and was the first chair of the editorial board of the Fletcher Forum of International Affairs, a journal examining issues in international relations. 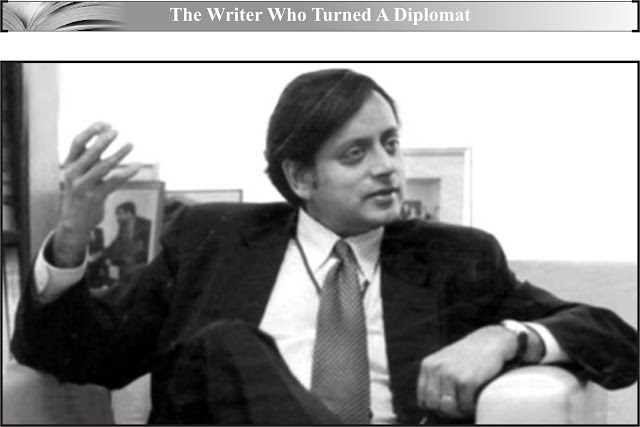 Tharoor writes a fortnightly column for The Hindu newspaper since 2001 and a weekly column, “Shashi on Sunday”, in the Times of India starting January 2007. Previously he was a columnist for the Gentleman magazine and the Indian Express newspaper, as well as a frequent contributor to Newsweek International and the International Herald Tribune. His op-eds and book reviews have appeared in the Washington Post, the New York Times and the Los Angeles Times, amongst other papers. Most of Tharoo’rs literary creations are centered around Indian themes and they are markedly “Indo-nostalgic”. 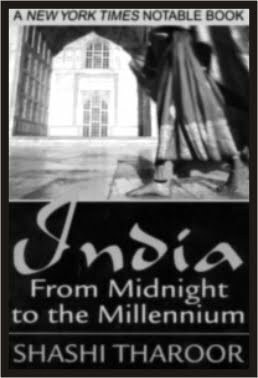 Perhaps his most famous work is The Great Indian Novel, published in 1989, in which he uses the narrative and theme of the famous Indian epic Mahabharata to weave a satirical story of Indian life in a non-linear mode with the characters drawn from the Indian Independence Movement. His novel Show Business (1992) was made into the film Bollywood (1994). The late Ismail Merchant had announced his wish to make a film of Tharoor’s novel Riot shortly before Merchant’s death in 2005.